Although Indy may have been inspired by the steely, expressionless, generic treasure hunters of the cheaply-made adventure serials of the 1930s and 1940s, Harrison Ford’s characterization as the resourceful, cunning, and brave yet vulnerable archaeologist has led to Dr. Henry Walton “Indiana” Jones Jr. often ranked being among the greatest and coolest heroes in cinematic history. Indy came in 2nd on AFI’s 2003 list of the greatest film heroes of all time, 2nd on Entertainment Weekly’s list of The All-Time Coolest Heroes of Pop Culture, and 6th and 7th as the greatest movie characters of all time by Empire and Premiere magazines, respectively. After the success of Raiders of the Lost Ark in 1981, Ford enthusiastically went on to play the character in a prequel (Indiana Jones and the Temple of Doom), a sequel (Indiana Jones and the Last Crusade), and a follow-up several decades later (Indiana Jones and the Kingdom of the Crystal Skull). 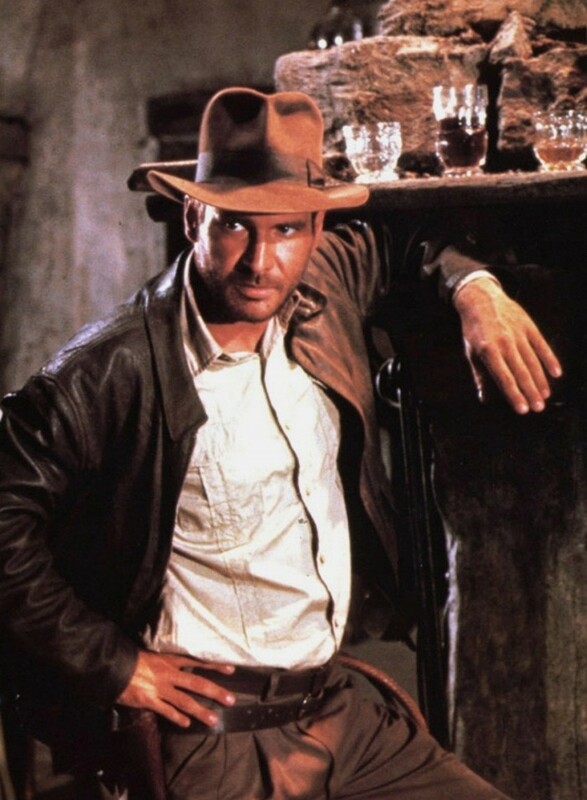 For true in-depth research into the iconic costume of Indiana Jones, the experts at IndyGear.com have got you covered with the definitive breakdown for everything from his fedora and leather jacket to his boots and bull whip. Indiana Jones’s trademark outfit is one of the most memorable, beloved, and iconic costumes in movie history. The hat and jacket are currently on display at the Smithsonian National Museum of American History and his kangaroo-hide bull whip sold at Christie’s auction house for $43,000 in December 1999. For Raiders of the Lost Ark, costume designer Deborah Nadoolman noted the original serials to which Spielberg and team were paying homage. She based the flying jacket and fedora on something similar worn by Charlton Heston’s treasure-hunting adventurer in Secret of the Incas (1954). Nadoolman’s concept of “ten military-style plain cuffed and plain hemmed leather jackets” resulted in an order from Wilson’s Leather in Los Angeles that was basically a modified Type A-2 flight jacket. Indy’s jacket has been on his back for plenty of years, but it’s “mileage” like this that adds the distress. The A-2 jacket, originally designated as “Jacket, Pilot’s (summer)” for the U.S. military, had details that varied based on the manufacturer but all featured a snap-down collar, epaulettes, patch pockets on each hip that close with a snap-down flap, and jersey-knit cuffs and hem. The Wilson’s jackets were essentially A-2 jackets altered without the knit cuffs and waistband. After various testings that are best described at IndyGear.com, the final film-used jackets were eventually made by Peter Botwright and sourced from Leather Concessionaires. The definitive Indiana Jones flight jacket is made from brown lambskin with a shirt-style collar that varies in size from film to film. The original shiny aluminum zippers were reportedly painted over in brass to dull their distracting presence on screen. The shoulders are left plain with no epaulettes or straps. Although the jackets used in the production were new, the leather was always artificially aged by the costume team as seen here in Raiders of the Lost Ark and Indiana Jones and the Temple of Doom. The set-in sleeves maintained the original alteration from the A-2 jacket omitting the knitting on the cuffs, instead ending in plain leather. The cuffs have no buttons or zippers as found on the naval Type 440 jacket as these would certainly get in the way as Indy is required to perform his various stunts. Similar to the original A-2, Indy’s flight jacket has large bellows pockets on the hips. These patch pockets close with concealed snaps on slightly pointed flaps. There are no handwarmers behind the bellows pockets, as hands in pockets were considered “un-military” at the time of the A-2’s development. The large bellows pockets on Indy’s flight jacket, seen here in Raiders of the Lost Ark, served a functional purpose for transporting and protecting rare but large ancient artifacts while fighting impossibly large henchmen. One very distinctive difference from original A-2 jackets were the “action-back” side pleats and the short leather adjustable straps that tightened the waistband through small brass buckles. These straps were likely inspired by the design of the 1930s Type 440 flight jackets sported by U.S. Navy fighter pilots. The jacket also has a yoke across the back shoulders with seams that extend slightly diagonally from the neck to the top of the shoulders and a seam across the upper back. Indy’s side pleats give him a greater range of movement for hanging from various ledges and fighting off angry tribes while also adding a distinctive vintage look… although the adjustable straps are one more thing that could become an impediment if caught on something. Certain aspects of the jacket were enlarged or modified for the jacket in Indiana Jones and the Last Crusade, which also saw the return of original jacket maker Botwright. In addition to a heavier weight leather, the jacket also features a larger collar with a snap closure at the top and a wide storm flap over the zipper. IndyGear.com provides a great analysis and history of Indiana Jones’ brown leather flight jacket in all of the films. All of Dr. Jones’s adventure attire is military-inspired in one way or another, and his khaki cotton safari shirt is no exception. Field shirts have been popular from outdoorsy clothing brands like L.L. Bean for decades, but Indy’s shirt is differentiated by the single vertical self-strip that runs down each front panel of the shirt from under the shoulder straps to the bottom hem, running over the center of each breast pocket. The shirt has a spread collar and seven buttons down the front placket that get progressively darker in each movie. The two patch pockets on the chest close with a single button on a pointed flap. The epaulettes are sewn at the shoulders and button down on the pointed end at the neck. 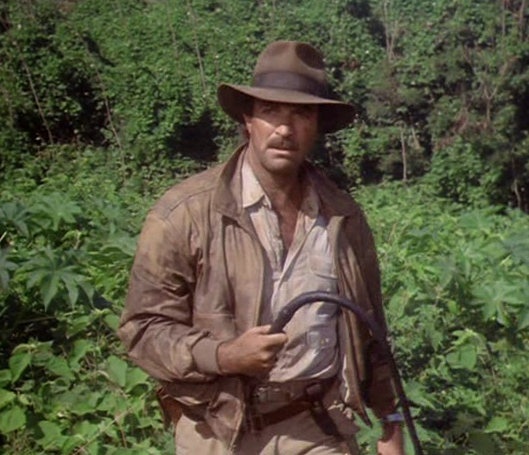 The sleeves have a single-button squared cuff, although Indy often rolls up his sleeves… or just rips them off, as seen in Indiana Jones and the Temple of Doom. According to IndyGear.com, the shirt was originally designed by Andreas Dometakis. Indy’s safari shirt sees its fair share of wear and tear in Raiders of the Lost Ark… although not nearly as much as in Indiana Jones and the Temple of Doom when he loses his sleeves! Although Indiana Jones always wears a tie – be it a necktie or a bow tie – with his suits, it is only in Indiana Jones and the Last Crusade that he dresses up his adventurer outfit by donning what IndyGear.com describes as “a black Irish poplin tie” with a pointed blade and a four-in-hand knot. Sean Connery wears a tweed three-piece suit, checked trilby, bow tie, and glasses that all contribute to subliminally aging the 59-year-old actor to have the appearance of an older man. However, it is worth noting that Indy seems to have taken some style cues from dear old dad with the tweedy suits and bow ties that he wears while teaching at Marshall College. Indy appears to be wearing a variation of “pinks”, the light military shade of brown khaki twill wool trousers worn by U.S. Army and Army Air Corps officers during the World War II era. These trousers have single reverse pleats, seven belt loops, and a 4″ military style plain hem to give his bottoms enough of a break over his boots while scampering all over the world’s ancient obstacles. More information can be found at IndyGear.com, which determined that they were likely subcontracted by Angels Costumes in London to be tailored for Ford. He appears to be wearing a lighter pair, closer to tan, in Indiana Jones and the Last Crusade. Indy’s military-style trousers as seen in Raiders of the Lost Ark (left) and Indiana Jones and the Temple of Doom (right). Indy faces his greatest fear during the pre-credits sequence of Raiders of the Lost Ark. Luckily, snakes don’t have the dexterity to open a button fly or he’d be in real trouble. Indy wears a WWII-era brown U.S. Army officer’s style cotton web belt with a brass slider buckle. 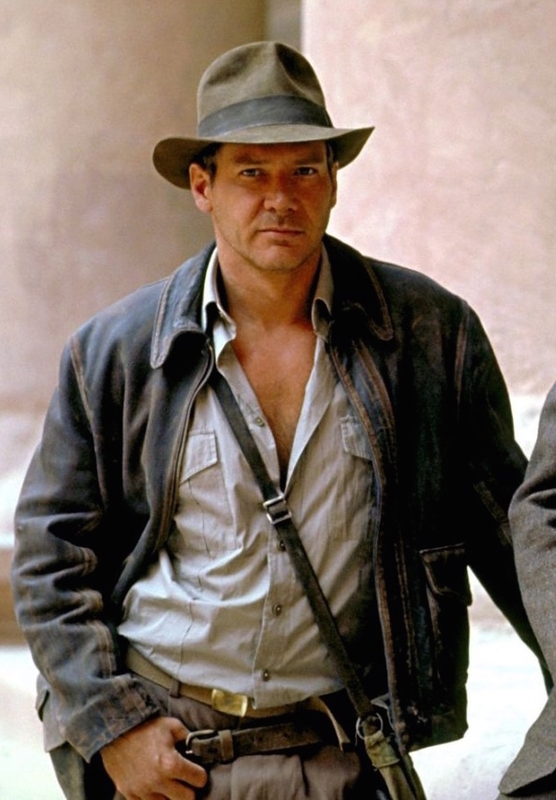 Although dark brown in the first two films, Indy seems to switch to a lighter colored belt that more closely matches his brown twill trousers in Indiana Jones and the Last Crusade. Though they share some cosmetic similarities with military boots, Indy’s footwear was actually informed by Harrison Ford. Ford was reportedly a fan of the Middleborough, Massachusetts-based Alden Shoe Company‘s boots and sported the stock model 405 Truebalance in each of the Indiana Jones adventures… establishing their enduring popularity as “the Indy boot”. More information can be found at IndyGear.com, of course, and interested buyers can still buy the “405 Original Brown” work boots. Indy has a rough day in Raiders of the Lost Ark. Indy’s leather Alden 405 ankle boots are brown waxhide with matching round brown laces through five eyelets and four hooks. The boots have an apron toe, rubber heels, and leather-faced cotton duck lining. He wears them with dark brown socks, likely cotton as they look lighter than wool, which would be oppressive in the action-packed heat that seems to follow Dr. Jones around the globe. Indy’s flying (or, at least, landing) skills may not be up to par, but at least he knows how to double-clutch a truck. One of the best-known aspects of the Indiana Jones costume is his loyal, well-traveled hat, which always seems to find a way back to his head despite the improbability of its return. While functional from a filmmaking perspective for both continuity and stunt double ease, it’s also a callback to the original serials of the ’30s and ’40s where our hat-wearing hero was never without his headgear despite his situation. This trope would get another wink at the end of the decade in the Coen brothers’ noir-ish masterpiece Miller’s Crossing. Indy’s hat was sourced from Herbert Johnson Hatters in Savile Row, where Nadoolman had grabbed and twisted one of the shop’s Australian model fedoras then joined Harrison Ford in sitting on it to create “a very lived-in and well-loved” hat. The original material for Raiders of the Lost Ark was a very vintage-like lightweight rabbit felt that was replaced by a slightly heavier Borsalino felt for the next installment. Indy’s hat proves its usefulness when taking a snooze in Indiana Jones and the Temple of Doom. IndyGear.com did the research to determine the original specifications of Indy’s brown fedora: size 7¼ with a tall 5.5″ pinched crown, a 1.5″ darker brown grosgrain ribbon, and a wide brim that extended 2 ⅝” on each side and 2¾ in the front and back; the front of the brim was shaped down to cover his eyes and further facilitate the ease of swapping in a stunt double for Ford without the double’s face being too obvious to audiences. As Indiana Jones gets himself into some tough spots, he is prepared to protect his hands when needed with a pair of tan leather plain work gloves, which are debossed with the word “LARGE” on the inside of the wrist as seen in Raiders of the Lost Ark. One of many tough spots in which Indy finds himself in Raiders of the Lost Ark. For less tense moments that require careful examination rather than quick action, Indy wears his 14kt gold-framed Savile Row “Beaufort Panto” glasses “Chestnut” tortoise rims and half-covered cable, as identified by SunglassesID.com. To the best of my recollection, Indy only wears his glasses with his adventurer outfit in Raiders of the Lost Ark. Otherwise, they are relegated only to be worn with his professorial suits. Sometimes, big bellows pockets on your jacket just ain’t enough for transporting ancient artifacts around the globe… thus, Indy carries a drab-colored modified British Mark VII gas mask bag as a satchel. This bag, definitively identified by IndyGear.com, had been issued to British military and police during World War II as a precaution against the sad realities of the war. The bag’s original cotton web strap (similar to Indy’s belt) was replaced on screen with leather straps – with buckle adjusters – in various shades of brown, beginning with a lighter brown in Raiders of the Lost Ark and darker brown straps in the subsequent movies. As a definitively American hero, Indiana Jones is always packing heat for his dangerous travels. His sidearm of choice varied from movie to movie, always carried in a brown leather military-style flap holster on the right side of a brown leather gun belt. IndyGear.com put plenty of research into analyzing the subtle differences between each gun belt and holster, including a design for the lighter brown holster that was custom-made for Indy’s Smith & Wesson revolver in Raiders of the Lost Ark before he switched to a much darker 1917-manufactured holster specifically designed for the Webley .455 revolver in his subsequent adventures. …and he quickly and efficiently dispatches of the swordsman with a single shot before going about his business. David Morgan crafted many of Indy’s iconic kangaroo-hide bullwhips for the first three movies in the series, averaging 10 feet long but all within a range of 6 to 16 feet as reported by IndyGear.com and IMDB. Indy’s bullwhip secured to his gun belt, as seen in Raiders of the Lost Ark. No matter how long it is, a bullwhip can be a cumbersome thing to carry around. Luckily, Indy has a handy brown leather strip attached to his gun belt, through which he can loop his distinctive tool. The tan leather loop in Raiders of the Lost Ark was riveted to the low-hanging gun belt on his left hip, the darker model in Indiana Jones and the Temple of Doom was slid over the belt, and the whip holder in Indiana Jones and the Last Crusade was slid over both the gun belt and his trouser belt, providing the most secure fastening for all of Indy’s various tools. As with Han Solo, much of what audiences loved about Indiana Jones came from Harrison Ford’s decisions and characterization. In fact, Ford much preferred playing Dr. Jones… despite not sharing the character’s fear or hatred of snakes. It was Ford who quipped the now-famous line “It’s not the years, honey, it’s the mileage,” when explaining himself to Marion Ravenwood (Karen Allen) in Raiders of the Lost Ark, and it was also Ford who informed the now-famous scene against the flamboyant Arab swordsman on the streets of Cairo. I had chosen to eat native food, unlike Steven who went to Tunisia with a steamer trunk full of Spaghetti-Os, and I had suffered mightily for that. I was no longer capable of staying out of my trailer for more than it took to expose a role of film, which was 10 minutes, and then I would have to flee back there for sanitary facilities. Thus, Ford suggested just drawing his revolver and shooting his attacker. While the actor, Terry Richards, was disappointed that he didn’t get to show off his impressive abilities after much training, Spielberg immediately loved the idea and ran with it. Indiana Jones proves that the gun is mightier than the sword. Indiana Jones clearly has a hankering for Jack Daniel’s whiskey, drinking the classic No. 7 Black Label when visiting Marion Ravenwood’s saloon in Nepal and later mourning her “death” in Cairo with a bottle of Belle of Lincoln. Shades of Casablanca as Indy “mourns” a lost love. While it may not be recognizable to Frank Sinatra (who hardly went a day without his square bottled and black labelled Tennessee nectar), the bottle of Belle of Lincoln whiskey that Indy turns to after the truck explosion in Cairo shows just how much the filmmakers had done their work. 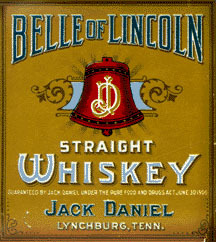 Belle of Lincoln was the name applied to a new brand of whiskey from the Jack Daniel’s distillery in the early 1890s, supposedly given its vague name to pay tribute to the lifelong bachelor Mr. Daniel’s many female paramours at the time who each believed the moniker was for her. Jack Daniel died in October 1911, and the Belle of Lincoln brand name shortly followed but was revived in 1979 in the form of a collectible decanter. Indiana Jones’s military-inspired adventure outfit is one of the most iconic movie costumes of all time, and the experts at IndyGear.com are the definitive source for learning more about every piece of his attire from his brown fedora to his leather flight jacket to his well-worn Alden boots. Harrison Ford as Indiana Jones in Indiana Jones and the Last Crusade (1989). Meeting up with dad or flying in style on a German zeppelin? Dress up your adventurous attire with a black poplin tie! As a self-proclaimed “cautious fellow”, Indiana Jones has a preference for early 20th century military revolvers chambered for powerful .45-caliber cartridges. When we first meet Indiana Jones in Raiders of the Lost Ark, it is 1936 and he is in search of a golden idol in Peru. Unfortunately, he is waylaid by natives led by his rival, the Nazi sympathizer Dr. René Belloq (Paul Freeman), who relieves Indy of his sidearm, a Smith & Wesson M1917 which had its original 6″ barrel custom modified down to 4″. Interestingly, the same Smith & Wesson M1917 is clearly seen to be the same revolver that Indy packs when heading to Nepal… but it is a Smith & Wesson Mk II Hand Ejector that he actually carries and uses for the remainder of his adventures in Raiders of the Lost Ark. When the bulk of Indy’s adventures start in Raiders of the Lost Ark, he is now carrying a Smith & Wesson Mk II Hand Ejector, chambered in the British .455 Webley round as it was sourced from a British armorer, Bapty & Co. This revolver is most easily differentiated by its ramp front sight as opposed to the bladed front sight on the M1917. Indy disables a truck driver in Cairo with a single shot from his Smith & Wesson Mk II Hand Ejector. According to IndyGear.com and IMFDb, both of these 4″-barreled Smith & Wesson revolvers were provided by Stembridge Gun Rentals in California, with the blank-firing Mk II Hand Ejector obtained from Bapty in the U.K. Thus, the M1917 would have been used for all U.S. studio filming while the Mk II Hand Ejector was utilized for location filming in the U.K. and Middle East. IMDB states that sound designer Ben Burtt used the sound of a .30-30 Winchester rifle for Indy’s revolver. Indy draws his Inglis Hi-Power aboard the Bantu Wind. He had previously used a Browning Hi-Power in Nepal and may have lost it, replacing it with this Inglis model… or it’s simply an anachronistic continuity error. Indy spends the bulk of his adventurer scenes in Indiana Jones and the Temple of Doom without a sidearm after Willie Scott had notably dropped his Colt Official Police revolver out the window of their getaway car in Shanghai while he was clad in his white dinner jacket. It has been confirmed that this revolver was indeed a Colt Official Police – with a Smith & Wesson Model 10 swapped in for the actual fall – and not either of the revolvers used in production of Raiders of the Lost Ark. Indiana Jones once again finds himself armed in Indiana Jones and the Last Crusade, this time with a Webley “WG” Army Model revolver, chambered again for the .455 Webley military cartridge. Unlike the previous films where Indy opted for an American revolver with a swing-out cylinder and a 4″ barrel, this is a British break-top revolver with a 6″ barrel. Originally manufactured in the late 1890s, the Webley “WG” Army Model was actually a commercial variant of the British Army’s service revolver for private purchased by officers; the “WG” stands for “Webley Government” rather than the often incorrectly referenced “Webley-Green”. Dr. Elsa Schneider (Alison Doody) stands behind Indy as he draws his Webley “WG” Army revolver in Indiana Jones and the Last Crusade. Interestingly, Indy’s holster in both Indiana Jones and the Temple of Doom and Indiana Jones and the Last Crusade was an original WWI item meant for a 6″-barreled Webley. He again carries a Webley “WG” Army Model in 2008’s Indiana Jones and the Kingdom of the Crystal Skull. Buy the trilogy. If you also enjoy having the latest installment, Indiana Jones and the Kingdom of the Crystal Skull in your collection, “The Complete Adventure Collection” now includes all four movies. I still haven’t seen Indiana Jones and the Kingdom of the Crystal Skull, and I’m also aware that the costume – while cosmetically similar to his previous attire – was much differently sourced than in the original series… hence the focus on the first three movies in this post. One can only wonder how much different the franchise would’ve been if the role of Indiana Smith (as he was originally named) had gone to Tom Selleck, who only turned down the role as he was already committed to Magnum, P.I. Interestingly, Thomas Magnum would eventually parody the character in the eighth season episode “Legend of the Lost Art” that found Magnum wearing a brown fedora and leather jacket, carrying a whip, and evading booby traps. Selleck would also play an Indy-like aviator in the 1984 adventure High Road to China. But talking of Miller’s Crossing how’s about Tom’s getup; classic 3 piece suit, overcoat, hat but rakish (I recall from a director’s commentary of The Usual Suspects that Gabriel Byrne had the ability to wrinkle clothes as soon as he puts them on). And in a similar vein Sam Lowry (Jonathan Pryce) from Brazil. Great suggestions, thanks! I have Tom all screencapped and will try to get a post up soon. If you can believe it, I still haven’t seen Brazil but have always wanted to! Will definitely need to check it out sooner rather than later now. Read an article that said Bernie Pollack (brother of Sydney) who is the personal costumer for Ford and Redford, put this costume together. Did you read anything about that? Great write-up,LS! “Raiders” remains one of my all-time favourite films, and it holds the title of my “Most Viewed Movie in a Cinema”. I saw it eight times on the big screen. Indy’s outfit has always been a favourite, although I’ve always been careful not to mimic the look too closely for fear of being seen as though I’m on my way to a costume party. Hence, I don’t have a leather jacket, but have often worn one of my fedoras with a denim or canvas jacket to approximate the look. I agree that the indygear website is a treasure trove of information, and I also visit uswings.com for similar jackets and other military-inspired gear. Gotta get an Indy jacket someday. Aside from the whole reference to the character, they look pretty damn comfortable, practical and get better as they age. It’s a shame they didn’t make a few more Indy films a little closer together. With news of a fifth film due out in 2019, I think Ford’s stunt double will be earning his pay check, no doubt. Enjoy “Crystal Skull” when you see it. Might be the weakest in the series, but it has some good moments in it. I bet your take on Indy is pretty cool! I’d love to feature that the next time I do a round of “Show Us Your BAMF” if you have any photos. I have a few old bomber jackets – some inherited, some found – that all have elements of Indy jackets, but the actual Indy jacket has still eluded me. Maybe the next windfall income means an Indy jacket is in my future… (as soon as I get that first Rolex Sub, of course.) Hope you’re well! Interesting post. You say “Indy’s hat was sourced from Herbert Johnson Hatters in Savile Row, where Nadoolman had grabbed and twisted one of the shop’s Australian model fedoras”. Was the hat one made by famous Australian company Akubra?